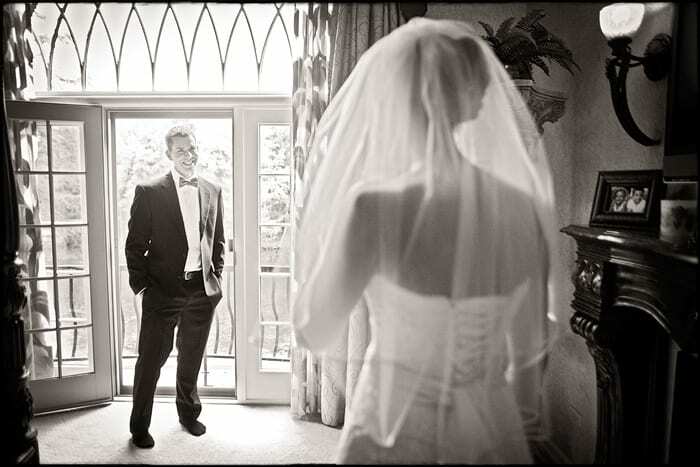 Our blog post this evening contains one of my favorite images from a wedding in New York this fall – the first time a groom sees his soon-to-be bride. As a photographer, I love this moment. It is filled with an intensity that demands you capture the scene precisely. No exceptions. As a photojournalist, you live for moments like this, wonderful light, a great location, the ability to move around and compose, and most importantly, an expression that captures everything a wedding day entails. Wedding photography is not true journalism in the sense that we don’t completely stand away from everything. We are trying to tell a story but in this case, we had a little bit of control as to when the moment takes place – you don’t control the moment by telling the bride and groom how to stand or pose when they see each other, but we did set up the time that this would take place. I remember this particular moment like it was one hour ago. Bryan had turned around to face the sliding glass door of the bedroom. He was gazing outside while we brought Meg into the room. As a photographer, you are so visually tuned to what is going on but it was what Bryan said that I remember most. He didn’t turn around immediately but knew she had entered. He simply said, “I love you, Meg.” We then asked Bryan to turn around when he was ready. I stepped back and this is what I captured. I’m not sure I need to explain this moment, but it was certainly touching, warm, and powerful to witness.